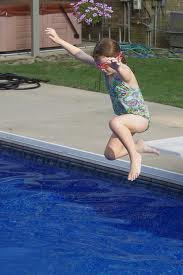 Learning Profiles vs. Learning Styles ~ No Limits on Learning! I know I've neglected this blog, but after a recent #efamath chat (and a little hint from @druinok) I'm ready to dive back in and am ready to share, reflect and learn! Over the past two years, our district has wholeheartedly embraced differentiated instruction (aka DI) and they are doing everything right to make certain that we know, understand, and do everything to embrace it, too. In my role as an instructional specialist (an instructional "coach" for our school) I have participated in all kinds of wonderful additional professional development, have planned training for our departments and school, and have tried a lot of new things in my classroom. These struggles and successes have provided enough material for at least 10 new blog posts, and I hope to use this forum as a place to help reflect and sort through what I've learned. In Embedded Formative Assessment, the author discusses the "myth" of Learning Styles and the lack of research to substantiate the use of learning styles to improve learning. Several teachers mentioned this misconception in the recent #efachat, and I will raise my hand to admit that I've given kids quizzes at the beginning of the year to assess learning styles! Thanks to some amazing training (first at a DI Institute with Carol Ann Tomlinson and then with a lot of follow up from my district) I now have a better understanding of a learner's profile, rather than a learning style, and have used learners' profiles a bit in my classroom. It has taken me almost 2 years to comprehend and begin to implement the DI philosophy into my classroom (DI is not a set of strategies, by the way!) so a blog post will not do it justice. However, for the sake of getting to the point, one of the non-negotiables of DI is flexible grouping. According to Tomlinson, you may group students based on readiness, interest, or learner profile (or random) and each grouping achieves different goals. Readiness leads to growth, grouping by interest increases motivation, and grouping by learner's profile improves efficiency. 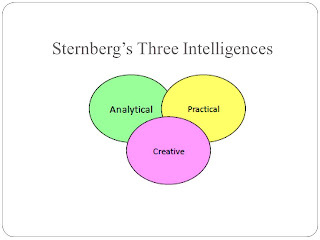 The DI gurus use either Robert Sternberg's Theory of Multiple Intelligences (analytical, creative, practical) or Howard Gardner's Multiple Intelligences Theory (which I believe more people know) to address learning profiles. For my classroom this year, instead of the good ol' learning styles quiz (auditory, visual, kinesthetic) that I had used in the past, I tried assessing my students on Gardner's multiple intelligences. With my class blog post, I found several surveys (online and paper copies), included videos and definitions, and had the kids complete a Google form with their results. I'm really looking forward to reading the rest of the book, and the book is about using assessments, not the small tangent of learning styles/profiles. 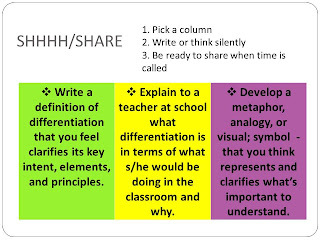 But in learning about differentiation, I really see the connection and importance of both. Isn't the bottom line that we must know our students?? Once again, thanks to @druinok and #made4math to motivate me to start blogging in the first place. I've been an avid blog reader for several years, but writing about practices really helps me solidify my thinking. Thanks for reading! Anything to add? What else do you know about learning profiles?